Counting n-grams lies at the core of any frequentist corpus analysis and is often considered a trivial matter. Going beyond consecutive n-grams to patterns such as skipgrams and flexgrams increases the demand for efficient solutions. The need to operate on big corpus data does so even more. Lossless compression and non-trivial algorithms are needed to lower the memory demands, yet retain good speed. Colibri Core is software for the efficient computation and querying of n-grams, skipgrams and flexgrams from corpus data. The resulting pattern models can be analysed and compared in various ways. The software offers a programming library for C++ and Python, as well as command-line tools. The n-gram, a sequence of n consecutive word tokens, is a core concept for many Natural Language Processing (NLP) applications. One of the most basic NLP tasks is to read corpus text and compute an n-gram frequency list, elementary for any kind of statistical analysis. The unigram frequency list, i.e. the word frequency list, is the simplest instance of this task which is especially ubiquitous. Computing n-gram frequency on a corpus text is fairly trivial, and any beginning computer science student will have no trouble to accomplish this in just a few lines of code in a modern high-level programming language. However, optimising this to reduce memory constraints, improve speed, and scale to large data, is a more complex matter. Colibri Core, the NLP software we introduce here, offers efficient algorithms to do this. N-grams are typically distributed in a Zipfian fashion, implying there are only a few high-frequency patterns, with words such as common function words in the lead, and there is a long tail of patterns that occur only very sparsely. This basic fact makes counting a notoriously memory-hungry enterprise, as patterns occurring below a minimum frequency threshold can not be discarded from memory until the entire corpus has been processed sequentially. When working with large data sets and higher-order n-ngrams, this memory problem becomes apparent quickly when trivial solutions are employed. Colibri Core, on the other hand, offers tools and programming libraries that are heavily optimised to 1) reduce memory usage, and 2) offer high-speed performance. The task of finding n-grams is generalised in Colibri Core to the task of finding patterns or constructions (we use the terms interchangeably). Furthermore, once patterns are identified, resulting in a pattern model, Colibri Core can extract relations between the patterns. As the name Colibri Core suggests, the software is geared to provide core functionality for modelling patterns and exposes this functionality as a programming library as well as through command line tools. It aims to provide a solid foundation upon which more specialised software can be built, such as software for language modelling. The software is aimed at NLP software developers and researchers with a solid technical background. Pattern extraction, and with it pattern matching, plays an important role in computer science. In the NLP literature, n-grams are a common type of pattern, and their modelling is often researched in the context of statistical language modelling. Software that springs from such studies is widespread in the field. Examples, by no means exhaustive, are SRILM , IRSTLM , and KenLM . Focus on efficient modelling with regards to memory consumption and look-up speed is an important component in such studies. Others also focus on big data storage in this field , though this study did not produce a usable open source software solution. Colibri Core, however, takes a step back and is not a language modelling toolkit and therefore can’t be readily compared with one. It is, however, very suitable to be used as a foundation to that end, which has been done by one study already . What we do have in common with language modelling toolkits is that both types of systems contain a store of patterns (i.e. n-grams or beyond) and their frequencies, in which quick look-up is essential, and both provide a procedure to compute such a model. Both LM toolkits as well as Colibri Core employ various optimisations to reduce the memory usage of this store, and keep access times high. Language Modelling toolkits do not generally offer any of the functionality Colibri Core offers when it comes to thresholding, indexing, nor the modelling of non-consecutive patterns such as skipgrams. The issue of skipgram extraction and modelling gained more traction in the past decade, see for instance . The notion of skipgram (or rather flexgram in our terms, as shall become apparent later) also plays a part in vector space representations  that have become increasingly popular. We think Colibri Core fills an interesting niche that is not covered by other readily available software. It provides solutions for the modelling of n-grams and skipgrams/flexgrams in an efficient and sufficiently extensible manner. The overall architecture of Colibri Core is visualised in Figure 1, from a data flow perspective. The components shown here will be discussed in this section. The Colibri Core architecture; light green squares represent data models, yellowish rounded squares represent processes that manipulate data. We will present the various features and optimisations that are implemented in Colibri Core. We start with a introduction of patterns and their encoding, Then discuss the implemented optimisation we use to count n-grams, and subsequently skipgrams. We then discuss more advanced parametrisation and end with a section on the computation of flexgrams. Our definitions are defined narrowly and, with exception of n-grams do not necessarily match up precisely to the way the concepts are used in other studies. Some may use the term skipgram to include what we call flexgram, or use another term such as “elastigram” to refer to flexgrams. Skipgrams are used in the field to obtain a higher level of generalisation than can be offered by n-grams. They can, for instance, be found as features in classification tasks , or as a means in language modelling to decrease perplexity [3, 10]. Dealing with word tokens implies that the corpus data has to be in a tokenised form. We start from the basis of plain-text corpus data, containing one unit per line; a unit can correspond to a sentence, paragraph, tweet or whatever unit is deemed appropriate for the task at hand. Corpus data can alternatively be provided in FoLiA XML format  as well, although linguistic annotation will be ignored. Text data is typically stored as a string of characters. The characters themselves draw their denotation from a character encoding. The storage of a huge amount of strings is inefficient from a memory perspective, considering the fact that words follow a Zipfian distribution. Colibri Core therefore works on the basis of a lossless compression, in which each unique word token is assigned a numeric type identifier, which we call a class. This effectively defines the vocabulary of your data, which we call a class encoding. A pattern is not represented as an array of characters, but as an array of these classes instead. Such methods are commonly employed in Language Modelling toolkits as well, where 24 or 32-bit integers uniquely assigned to words are typically chosen . In Colibri Core, further lossless compression is achieved by holding this array of classes in a dynamic-length byte representation rather than fixed-sized integers. This allows for low class values to be stored in fewer bytes than high class values. Classes 0 to 127 can be stored in a single byte, higher classes require at least two bytes. To achieve maximum compression, classes are assigned to word tokens based on frequency (i.e. entropy encoding): words with the highest frequency receive the lowest classes. This is essentially a variant of Huffman coding . Some of the lowest classes are reserved for special purposes, e.g. to delimit sentences (class 0) or as markers for out-of-vocabulary words (class 2) or skipped content (classes 3 and 4). Of each byte in the class representation, the highest bit is reserved as a continuation marker. As long as the continuation marker is set, the next byte is still part of the class. When it is low, we know we are at the final byte of a class representation. The class itself is stored in the remaining 7-bits of each byte. In practise this results in good compression and reduces memory usage; an example corpus taking up 221 MB on disk in plaintext form is reduced to just 60 MB when compressed. A subset of the Google billion word corpus, 769 million words in 30 million sentences, takes 3.9 GB in plaintext form, and 1.2 GB when compressed in this matter. To encode a text corpus, a class encoding needs to be computed first, as visualised in the top-left corner of Figure 1. To decode the encoded corpus back to plain text, the class encoding is needed again. Colibri Core provides tools and exposes library functions to do this. N-gram frequency lists are often parametrised by a certain threshold. All n-grams below this occurrence threshold are pruned. We can circumvent the problem of having to hold a huge amount of patterns in memory that do not meet the threshold, as is typical in a Zipfian distribution. We do this by employing informed counting. Informed counting is an iterative procedure, shown in pseudo code in Algorithm 1. Here we take m to be the maximum n-gram order we intend to extract. The whole corpus is then processed for each n where 1 < n ≤ m, extracting the respective n-grams at each iteration. This means that at each iteration, we can consult the results of the previous iteration. We can then readily discard any n-gram with n > 1 for which either of the two n – 1-grams it contains does not meet the threshold, as it follows that the n-gam can never meet the threshold either. By outright discarding an n-gram we do not need to store it and its count in memory. After each iteration of n, we prune all the n-grams that did not reach the threshold. Informed Iterative Counting for n-grams. Take m to be the maximum n-gram order we intend to extract, t to be the minimum occurrence threshold, and M to be the pattern model in memory, with unigrams already counted in the more trivial fashion. Though not expressed in the simplified algorithm above, the actual implementation accounts for more parameters, such as setting a lower bound to n. The amount of back-off, going all the way up to m – 1 here, can also be fine-tuned. This algorithm makes concessions to processing speed, as multiple passes over the data are needed, to conserve memory. A performance evaluation of this algorithm will be addressed later in the section on Quality Control. The computation of skipgrams is parametrised by an upper limit l ≤ m in the number of tokens, i.e. the total length of the skipgram (including gaps) expressed in tokens. The possible configuration of gaps increase exponentially with the total length spanned. A skipgram of size three has only one possible gap configuration1; a _ z, a skipgram of size four already has three possible configurations; a _ _ z, a b _ z or a _ y z. The algorithm, shown in Algorithm 2 considers all possible configurations in which skips can be inserted in all of the n-grams in the model. It can discard a skipgram candidate by looking at the non-skipped parts that make up the skipgram, and by checking whether those exceed the set threshold. Note that the computation of skipgrams first requires counts of all n-grams where 0 < n ≥ l.
Informed Counting for skipgrams. Take l to be the maximum skipgram order we intend to extract, t to be the minimum occurrence threshold, and M to be the pattern model in memory, with ngrams already counted. In this algorithm, the possible Configurations (ngram) function returns all possible skipgram configurations for the given n-gram. Note that the configuration of gaps depends only on the length of the n-gram, regardless of its content, and can therefore easily be pre-computed. The parts(skipgram) function returns all consecutive parts that are subsumed in the skipgram, i.e. the parts delimited by the gaps. Like Algorithm 1, Algorithm 2 assumes a threshold t > 1. When t = 1, more trivial algorithms are invoked, as the user does not want to prune anything. These make only a single pass over the data. For skipgrams this leads to an explosion of resulting patterns, exponential with number of tokens, and is best avoided. The minimum and maximum length (in words/tokens) of the n-grams and/or skipgrams to be extracted. Setting minimum and maximum length to the same value will produce a model of homogeneous pattern length (e.g. only trigrams or words). A secondary word occurrence threshold can be configured. This is a value set higher than the primary occurrence threshold. Only patterns occurring above the primary threshold, and for which each of the individual words/unigrams in the pattern passes the secondary threshold as well, will be included in the model. N-grams that are not subsumed by higher order n-grams, i.e. which do not occur as part of a higher order n-gram in the data/model, can be pruned from the model. This allows you to extract for instance all trigrams and all bigrams and unigrams that make up the trigrams, but not the bigrams and unigrams that are not subsumed in trigrams. Skipgrams can be constrained using the skip type threshold. This requires that at least the specified number of distinct patterns must fit in the gaps of the skipgram. Higher values will produce less skipgrams, but typically more generic ones. For instance, a skipgram such as The_house will then only be included in the model if the corpus has instances in which the gap can be filled by at least the specified number of distinct patterns. If the threshold is set to 2 for example, and the corpus contains The big house and The small house, then the skipgram The_house is included. If the corpus only has one of these instantiations, and no other instantiations of the skipgram either, then the skipgram would not be included. Skipgrams and n-grams are typically computed using the same occurrence threshold, but it is also possible to use a different threshold for skipgrams. A pattern model is a key → value store, where the keys correspond to patterns and the values typically correspond to occurrence counts, although any kind of other value is supported too. Our aim with pattern models is to have a data structure that allows for quick lookup and iteration, as well as quick insertion during training. Moreover, memory consumption should be as conservative as possible, to allow handling of big data. The underlying C++ library allows for choosing the actual underlying container implementation and value type through templating. The default container datatype is a hash map,2 which guarantees O(1) access and update times under ideal hashing conditions. The hash3 is computed directly from the binary representation of a pat- tern. Storing each pattern individually results in a lot of redundant information to be stored, as patterns overlap to a large degree. To conserve memory, the models can store pattern pointers4 instead. Instead of duplicating the content for each pattern, these point to the original corpus data which is held in memory. The use of hash maps can be contrasted to the use of suffix (or prefix) tries , a common datastructure for storing n-grams in which a tree is constructed and any path in the tree, complete or incomplete, corresponds to a suffix (or prefix). Although suffix tries also benefit from decreased memory use due to no overlap in pattern data, the strongly linked nature of tries causes a significant overhead in memory use5 that quickly exceeds the memory footprint of hash maps. For this reason, hash maps are the default and tries are currently not implemented in Colibi Core. The templating, however, does allow for such an implementation to be added in the future. This flexibility to abstract over the underlying data structure is one of the assets of Colibri Core. At this point, we need to address suffix arrays  as well, which is a sorted array of suffixes, derived from suffix tries but with significantly decreased space requirements. Suffix arrays with longest common prefix (LCP) arrays will consume less memory than our hash maps, but are typically much slower to construct and query. Though no exhaustive experiment was conducted to this end, we did compare a predecessor of Colibri Core with a suffix array implementation  and found our implementation to be significantly faster in model construction. Indexed Pattern Models – Values are arrays of indices where the pattern’s occurrences in the corpus are stored. Obviously, indexed pattern models make a considerably higher demand on memory. They do, however, allow for a broader range of computations, as shall become apparent in subsequent sections. The command-line tool colibri-patternmodeller exposes most of the functionality for training, viewing and editing pattern models (see also Figure 1). In the C++ and Python APIs, this functionality is generally available through methods on some flavour of the PatternModel class. Training indexed patterns models is more memory intensive than training unindexed models, especially in very large corpora (say at least a hundred million words). To lower the demand on memory for such corpora, we implement a two-step training procedure. This involves first constructing an unindexed pattern model and subsequently constructing an indexed model on the basis of that, by making another pass over the corpus and gathering all indices. The gain here is in avoiding temporary storage of the indices that will not pass the occurrence threshold but that cannot be ruled out a priori by the informed counting algorithm. This conservation of memory comes at the cost of extended execution time. 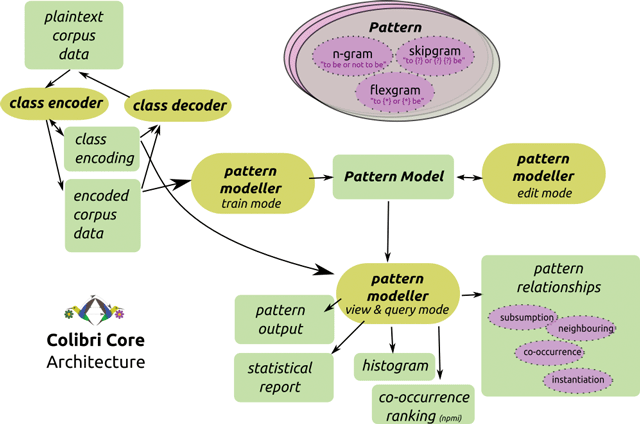 The computation of pattern models on two or more distinct corpora, provided the class encoding is the same for all of them, provides a basis for comparative corpus analysis. One measure for corpus comparison introduced in the software is the notion of coverage. This metric is expressed as the number of tokens in the test corpus that is covered by the patterns from the training corpus. This makes it an asymmetric metric, so the choice of training and test corpus matters. The metric can be represented either in absolute counts, or in normalised form as a fraction of the total amount of tokens in the test corpus. To perform such comparisons, we first compute a pattern model on the training corpus, and subsequently compute a second pattern model on the test corpus, but constrained by the former pattern model. The ability to train constrained models is present throughout the software and can for instance also be used to train a pattern model based on a custom preset list of patterns, effectively limiting the model to this preselection. The previously described two-step training algorithm is also an example of constrained training. Summarised statistics are computed at multiple levels. Measures such as occurrence count and coverage can be consulted for aggregates of n-grams, skipgrams, or flex- grams, as well as specific patterns. The former two can be inspected specifically for each of the different pattern sizes present in the model, i.e. for each value of n.
Various relations can be extracted between patterns in a pattern model, either through the API or a dedicated query tool. For all but the first of the relation types an indexed pattern model is required. Subsumption Relation – n-gram xyz subsumes n–1-grams xy and yz. Succession Relation – Patterns that occur in a sequence in the corpus data. For example: pattern x precedes yz and pattern z succeeds xy. Instantiation Relation – Skipgrams or flexgrams may be instantiated by other patterns. For example, “to be _ not _” be is instantiated by “or _ to”, resulting in the 6-gram “to be or not to be”. This type of relation thus allows you to precisely determine what patterns occur in certain gaps. Co-occurrence Relation – Different patterns can naturally co-occur multiple times within the the structural “units” you decided upon for the corpus (e.g. sentences, paragraphs, tweets, etc). These units are newline delimited in your original input. The measure of such co-occurrence can be expressed by established metrics such as Jaccard and (normalised) mutual pointwise information. For each of these categories, the relationship is bidirectional, i.e. you can query for the subsuming patterns as well as the subsumed patterns, the left neighbours as well as the right neighbours, the instantiations as well as the abstractions. The co-occurrence relationship is fully symmetrical. These latter three relationships rely on both the forward index inherent in an indexed pattern model, as well as the reverse index, a function from positions in the corpus to an array of patterns that are found at said position. The reverse index is not modelled in memory as an explicit mapping from positions to patterns, that would use too much memory, but as a simpler reverse index that only keeps track of where each unit/sentence starts. This can then be used to quickly resolve specific positions to all possible patterns. Thus far, we have explained the algorithms for n-gram counting and skipgram counting, but have not yet done so for flexgrams, i.e. patterns with variable-width gaps. The implementation allows flexgrams to be computed in two different ways. The first is by extracting skipgrams first, and then abstracting flexgrams from these skipgrams. In this case the flexgram computation is constrained by the same maximum-size limit under which the skipgrams have been extracted. The second method for flexgram extraction proceeds through the co-occurrence relation. A flexgram is formed whenever two patterns (within the same structural unit) co-occur above a set threshold. The implementation of this latter method is currently limited to flexgrams with a single variable-width gap. This method is recommended when the user is interested in long-distance flexgrams, whereas the abstraction method is recommended when the user is more interested in having multiple gaps or the relationship between flexgrams and skipgrams. In this section we conduct a performance evaluation of Colibri Core by measuring the time to compute a pattern model, and the memory resources used. Colibri Core performance benchmarks on the IWSLT data set. Performed by the colibri-benchmarks tool and the benchmarks.py script for the Python baselines. All non-Colibri Core references are marked with an asterisk (*). Memory usage is measured as the difference in resident memory after training and before training. Peak memory usage is measured absolutely as reported by the OS and included in parentheses. All experiments were performed on a Linux system with an Intel Xeon CPU (E5-2630L v3) at 1.80GHz and 256GB RAM. Parameter t refers to the occurrence threshold, l to the maximum pattern length. We perform tests without thresholding as well as with an occurrence threshold of 2, and extract anything from unigrams to 8-grams. For reference, we include a naive Python implementation that simply counts n-grams and stores them in a Python dictionary where the keys are strings and the values integers. We also include a comparable implementation that uses NLTK.9 Similarly, we include a naive C++ implementation based on a std::unordered_map<string,uint32_t>. The memory reduction that can be observed when comparing these against the Colibri Core models is attributed to the class encoding scheme we use. These memory opti- misations do come with a performance drawback that is especially noticeable when no thresholding is applied. The pattern pointer models prove capable of further reduction in memory consumption, and offer a clear speed advantage as well. The pointer models use a representation of patterns that refer to the original corpus data, which is fully loaded into memory, rather than storing a separate copy for each pattern. For the experiments with thresholding, we added a simple Python implementation of iterative counting and assess the value of the algorithm as such by comparing it against the naive Python implementation that simply prunes values below threshold at the very end. We clearly observe a drastic reduction in memory usage, at the cost of a longer execution time due to the multiple iterations. Though Colibri Core is not a Language Modelling toolkit in itself, a comparison with a popular third-party LM toolkit may be of interest. We compare an unindexed pattern model containing unigrams, bigrams and trigrams to a similar model in SRILM .10 Due to the many other features Colibri Core offers regarding thresholding, indexing, skipgrams and flexgrams, it can not yet rival the performance and memory efficiency of dedicated LM systems, which allow for more specific optimisations. Indexed Pattern Models are by definition larger in memory than unindexed models, but they do offer a significant speed benefit in the computation of skipgrams, both of this can be observed in Table 1. The C++ library allows for easy swapping of the underlying datastructure for pattern models. The default hashmap (std::unordered_map) solution can be contrasted to a pattern model using using an ordered map (std::map11). As expected, the ordered map proves to be significantly slower and does not yield a memory advantage either. As Colibri Core is suited for the processing of large data sets, provided sensible thresholds are set, we conduct extra experiments on the JRC-Acquis corpus, containing 31.3 million words in over 850, 000 sentences, and on a portion of the Google Billion Word corpus, where we use a set of 768 million words in 30 million sentences. These results are shown in Table 2. Benchmarks on two large data sets. Same setup as Table 1. Parameter y represents the occurrence threshold specifically for skipgrams. Noticeable in the big data experiments is the explosion in memory consumption when skipgrams are computed on an unindexed pattern model. This is attributed directly to the sheer amount of skipgrams that can be extracted from the data, and the fact that unindexed models can only compute skipgrams exhaustively and do not support the skip type threshold discussed in Section “Parametrisation: What counts?”. Extensive documentation, including API references for both Python and C++, is provided at https://proycon.github.io/colibri-core. An interactive tutorial for Python is also available. The next section will provide a small example of possible usage from the command line. Although we refer to the aforementioned documentation and the Python tutorial for extensive usage instructions, we include a short use case in this section and show how to use the command line tools. Assume you have a corpus corpus.txt and you want to extract all n-grams, skipgrams and flexgrams that occur more than five times. We set the maximum length to 8. For skipgrams, we add the additional constraint that it abstracts over at least three distinct ngrams, i.e. there are three different ways of filling the gaps. Flexgrams we derive from skipgrams. Once preprocessing is done, we can encode the corpus in a form suitable for Colibri Core, computing a class encoding and converting the data to it, as explained in section “Feature: Patterns”. The flow of this and all subsequent steps is also visualised in the architectural scheme in Figure 1. This will result in the encoded corpus corpus.tok.colibri.dat and the corresponding vocabulary file corpus.tok.colibri.cls. This step could have been combined with the previous one as well. We again urge the reader to consult the documentation and tutorials for a more extensive description of all available options and use cases, as this example only covers one out of many use cases, and further in-depth examples fall beyond the scope of this paper. Support, including but not limited to bug reports, feature requests and general pleas for assistance, is provided through the Github issue tracker at https://github.com/proycon/colibri-core/issues. As such, the archive of issues is always publicly consultable. Colibri Core should be able to run on modern POSIX-compliant operating systems, including Linux, FreeBSD and Mac OS X. It is tested to compile with current versions of both gcc as well as clang. Colibri Core is written in C++, adhering to the C++11 standard. The Python binding is written in Cython (0.23 or above) and supports both Python 2.7 as well as Python 3. The latter is recommended. The Python binding ensures that the functionality of Colibri Core is easily accessible from Python without sacrificing the great performance benefit native code provides. Python was chosen as it is a high-level programming language in widespread use in the scientific community, and the NLP community in particular. It demands less expertise from the developer than C++ and is more suitable for rapid prototyping. Colibri Core provides memory-based techniques where models are held entirely in memory to guarantee maximum performance on lookup and computation. This approach can be contrasted to e.g. database approaches which have much higher latency. It does place considerable memory requirements on the system on which is it run, though this depends entirely on the size of the data and the thresholds the user uses. We recommend at least 16GB RAM. In practise, using Colibri Core on high-end computing servers with 256GB RAM is not uncommon for extensive computation on big data sets. Colibri Core is single-threaded due to the non-distributable nature of most of the algorithms. A 64-bit architecture is required, 32-bit is not supported. Developed by Maarten van Gompel, with contributions and feedback from Louis Onrust and Antal van den Bosch (Centre for Language Studies, Radboud University Nijmegen). Colibri Core explicitly aims to provide a foundation for researchers in the NLP community to build their tools and research on. The software is already being employed in ongoing research on Machine Translation,15 Bayesian Language Modelling,16 Kneser-Ney Language Modelling,17 spelling correction,18 and event prediction in social media streams.19 This has culminated in the publication of several studies that use Colibri Core [16, 10, 7]. As a programming library for both C++ and Python, Colibri Core can be potentially adopted by a wide variety of third party developers. As a set of tools and scripts, Colibri Core also has merit standalone. It is, however, focused on command-line usage and therefore still requires a certain technical expertise from the end-user. To increase the accessibility of Colibri Core, a RESTful webservice as well as generic web interface is already provided through CLAM. With this we hope to meet the needs of less technical end-users, as well as automated networked clients. This webservice is hosted at https://webservices-lst.science.ru.nl. Future work building upon Colibri Core may focus on offering high-level user-interfaces to reach a wider audience, and on further improvement of its performance. 1The initial and final token may never be gaps in the extracted skipgrams. 5Each pointer consumes 8 bytes on 64-bit architectures, and one would be needed for every transition between two tokens. 8The data is from the IWSLT 2012 Evaluation Campaign, http://hltc.cs.ust.hk/iwslt/index.php/evaluation-campaign/ted-task.html#MTtrack. Tokenisation was performed using ucto, https://languagemachines.github.io/ucto. 10SRILM’s ngram-count is run in vanilla form, i.e. no smoothing or interpolation, with the options -no-bos -no-eos. Note that the encoding of classes is a separate step in Colibri Core, so our total CPU time should be considered to be a second longer than reported for a more fair comparison. D’hondt, E, Verberne, S, Weber, N, Koster, K and Boves, L (2012). ‘Using skipgrams and PoS-based feature selection for patent classification’. Computational Linguistics in the Netherlands Journal 2: 52–70. URL:http://clinjournal.org/sites/clinjournal.org/files/4Dhondt2012 0.pdf. Federico, M, Bertoldi, N and Cettolo, M (2008). IRSTLM: an open source toolkit for handling large scale language models In: ‘INTERSPEECH’. ISCA, pp. 1618–1621. URL:http://www.isca-speech.org/archive/interspeech_2008/i08_1618.html. Guthrie, D and Hepple, M (2010). Storing the web in memory: Space efficient language models with constant time retrieval. ‘Proceedings of the 2010 Conference on Empirical Methods in Natural Language Processing’, EMNLP ’10. Stroudsburg, PA, USAAssociation for Computational Linguistics: 262–272. URL:http://dl.acm.org/citation.cfm?id=1870658.1870684. Guthrie, D, Allison, B, Liu, W, Guthrie, L and Wilks, Y (2006). A closer look at skip-gram modelling. ‘Proceedings of the Fifth international Conference on Language Resources and Evaluation (LREC–2006)’. Genoa, Italy URL:http://citeseerx.ist.psu.edu/viewdoc/summary?doi=10.1.1.62.4714. Heafield, K (2011). KenLM: faster and smaller language model queries. ‘Proceedings of the EMNLP 2011 Sixth Workshop on Statistical Machine Translation’. Edinburgh, Scotland, United Kingdom: 187–197. URL:http://kheafield.com/professional/avenue/kenlm.pdf. Mikolov, T, Chen, K, Corrado, G and Dean, J (2013). ‘Efficient estimation of word representations in vector space’. CoRR, abs/1301.3781. URL:http://arxiv.org/abs/1301.3781. Onrust, L, van den Bosch, A and van Hamme, H (2016). Improving cross-domain n-gram language modelling with skipgrams. ‘In Proceedings of ACL’. To appear. Stehouwer, H and Van Zaanen, M (2010). Ganzha, M. and Paprzycki, M. eds. Finding patterns in strings using suffix arrays. ‘Proceedings of the International Multiconference on Computer Science and Information Technology’. Wisa, PolandIEEE: 505–511, DOI: https://doi.org/10.1109/IMCSIT.2010.5679928 URL:http://hdl.handle.net/11858/00-001M-0000-0012-3E7F-2. Stolcke, A (2002). Hansen, J. H. L. and Pellom, B. L. eds. Srilm – an extensible language modeling toolkit. 7th International Conference on Spoken Language Processing, ICSLP2002 – INTERSPEECH 2002. September 16–20, 2002, Denver, Colorado, USAISCA URL:http://www.speech.sri.com/projects/srilm/papers/icslp2002-srilm.pdf. van Gompel, M and Reynaert, M (2013). ‘FoLiA: A practical XML format for linguistic annotation – a descriptive and comparative study’. Computational Linguistics in the Netherlands Journal 3 URL:http://clinjournal.org/sites/clinjournal.org/files/05-vanGompel-Reynaert-CLIN2013.pdf. van Gompel, M and Reynaert, M (2014). CLAM: Quickly deploy NLP commandline tools on the web. ‘Proceedings of COLING 2014, the 25th International Conference on Computational Linguistics’. URL:http://aclweb.org/anthology/C14-2016. van Gompel, M and van den Bosch, A (2014). Translation assistance by translation of L1 fragments in an L2 context. ‘Proceedings of the 52nd Annual Meeting of the Association for Computational Linguistics (Volume 1: Long Papers)’. Baltimore, MarylandAssociation for Computational Linguistics: 871–880. URL: www.aclweb.org/anthology/P14-1082.